The popliteal fossa is a diamond shaped space lying posterior to the knee. Superiorly it is formed by the diverging semi-membranosis medially and bicpes femoris laterally. Inferiorly the diamond shape is completed by the medial and lateral heads of gastocnemius muscle. The floor of the space is formed by the femur superiorly, knee joint capsule and the popliteus muscle. The Sciatic nerve courses down the posterior thigh in the midline and enters the popliteal fossa emerging from under the biceps muscle to lie superficial and lateral to the popliteal artery. As the two course distally the nerve crosses the artery to lie postero-medial to it. During its passage the sciatic nerve divides into the Tibial and Common Peroneal nerves high up in the popliteal space. Further divisions arise more distally the most notable being the sural nerve postero-medially. The Common peroneal nerve leaves the midline and heads laterally passing towards the head of the fibula, lying successively on plantaris, gastrocnemius, popliteus tendon and soleus. The tibial nerve passes distally in the midline in the posterior compartment before padding posterior to the medial malleolus to supple the sole of the foot. Popliteal fossa sciatic nerve block is a technically straight forward procedure which offers excellent anaesthesia and analgesia for surgery on the knee, leg and foot. When combined with a saphenous nerve block or femoral block, the entire lower leg can be anaesthetised, providing an attractive alternative to neuraxial techniques. In addition, catheter placement is straight forward allowing for extended post-operative analgesia. The sacral plexus is formed by the lumbosacral trunk (L4-5) and the anterior divisions of S1-3. The plexus lies on the back of the pelvis between piriformis muscle and the pelvic fascia. The most important branches for the anaesthetist are the posterior cutaneous nerve of the thigh (L4,5,S1-3) and the sciatic nerve. The sciatic nerve descends the posterior aspect of the leg and can be found in the subgluteal region midway between the greater trochanter and the ischial tuberosity. It exits the pelvis via the greater sciatic foramen below piriformis and passes under gluteus maximus muscle towards the leg. It lies between the greater trochanter of the femur and the ischial tuberosity. In the upper leg it lies on adductor magnus and crossed obliquely by long head of biceps femoris. The sciatic nerve at this point is a flat ribbon which becomes more round in appearance as it descends down the posterior thigh. It innervates the muscles of the pelvis and posterior thigh before branching into tibial and peroneal nerves at a variable distance above the knee. These in turn supply most of the sensory and motor innervation of the lower leg and foot. The tibial nerve is the larger of the terminal branches of the sciatic nerve. It descends through the middle of the popliteal fossa to the lower part of popliteus muscle. It then runs with the popliteal artery beneath the soleus arch and into the lower leg. The common peroneal nerve is the smaller of the two branches of the sciatic nerve. It descends to the lateral side of the popliteal fossa towards the head of the fibula and close to the medial margin of biceps femoris. After passing around the neck of the fibula (beneath peroneus longus), it divides into superficial and deep peroneal nerves. 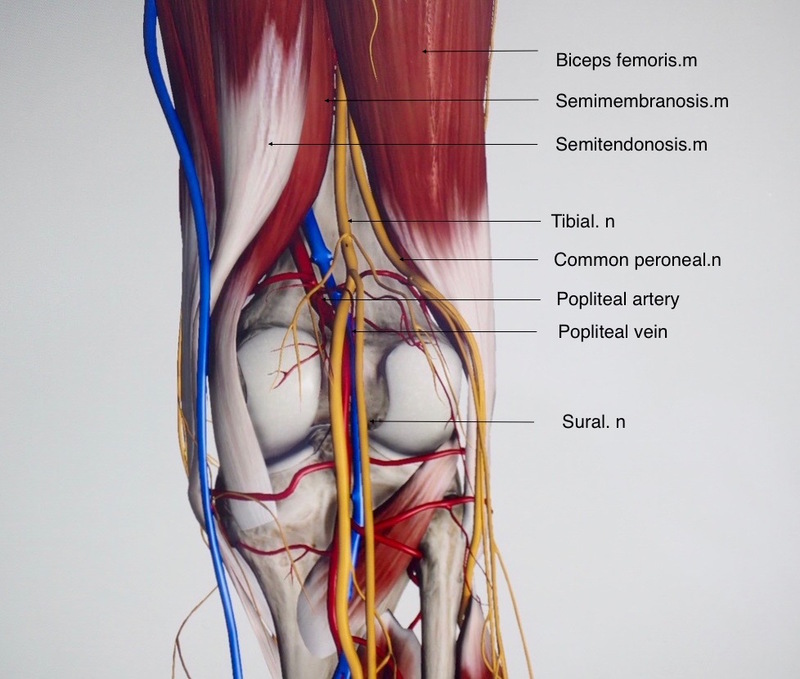 The sciatic nerve divides in the subgluteal region into its two branches, Tibial and Common Peroneal but these are bound together tightly by a paraneural sheath. In the popliteal fossa the nerves move apart, and at this point the paraneural sheath is capacious. A needle introduced between the nerves at their point of separation will penetrate the paraneural sheath and injection of local anaesthetic will surround both nerves. 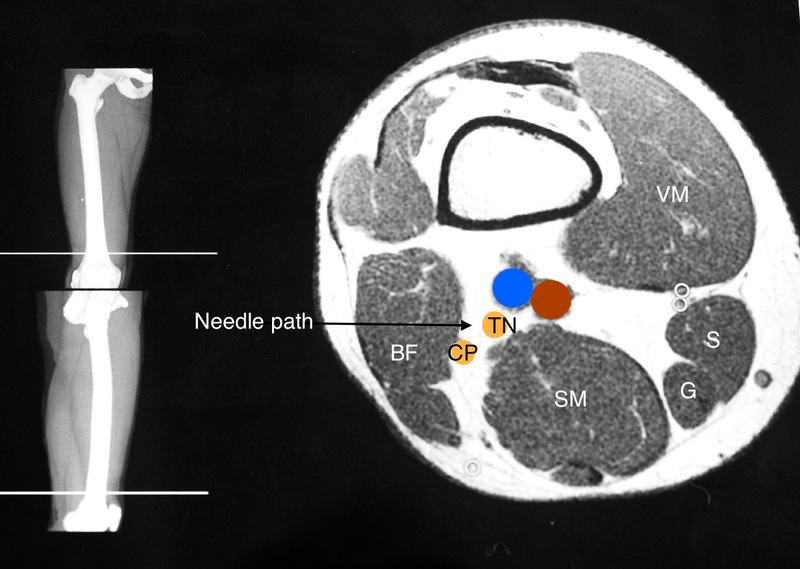 Fig 1 b. MRI of popliteal fossa showing Biceps femoris (BF); Vastus Medialis (VM); Sartorius (S); Gracilis (G); Semimembranosis (SM); Tibial nerve (TN and Common peroneal nerve (CP). Popliteal artery and vein (red and blue circles. The sciatic nerve is most easily seen lower in the popliteal fossa after it has split into tibial and peroneal nerves. Here it is in its most superficial position, usually in the middle of the popliteal fossa superficial (posterior) to the popliteal vein and artery. Lateral to the nerves lies the biceps femoris (BF) muscle and medially are semitendinosis (ST) and semimembranosis (SM). As the nerve is traced proximally, the two branches merge to form the sciatic nerve and the nerve becomes more deeply placed beneath the BF muscle. It is sometimes helpful to passively or actively dorsiflex and plantar flex the foot which moves the tibial nerve and common peroneal (lateral popliteal) nerves in alternating directions - the "see saw sign"
We do this block is with the patient in the lateral position, operative side uppermost and facing the anaesthetist. This allows the operator to look down the probe for needle alignment and across the patient to the ultrasound screen. The probe is held comfortably with the probe hand resting on the patient’s leg. Place the linear probe on the posterior of the knee at the skin crease, between biceps femoris and semi-membranosis tendons and press firmly. The soft tissues and popliteal vein are compressed and the nerves should be superficial (posterior) to the Popliteal artery. Angulate the probe to find the nerves (Probe usually perpendicular to the anterior surface of the thigh) then translocate the probe proximally and watch for the Common peroneal (CP) nerve joining the Tibial nerve (TN). The block is best performed just as the two nerves divide. Passive or active dorsiflexion and plantarflexion of the foot induces the “seesaw sign” with the CP and TN appearing to move up and down like a seesaw. This can help find or confirm the nerves. Assess depth of the nerves and bring block needle from the lateral side of the knee at the same or slightly greater depth below the probe so it will appear horizontal on the screen with very good imaging. The CP is lateral and more superficial to the TN so the needle can pass under the CP and into the space between the two. Careful angulation allows the needle to access this space. A pop is usually felt as the needle exits biceps femoris and enters the popliteal fossa. Once the needle is in the popliteal fossa, inject 1ml of LA and assess spread. Using hydrodissection and needle repositioning inject up 15-30ml around the nerves. Always aspirate before injection to ensure popliteal vessels have not been entered. The block onset takes 23-30 mins. Faster onset probably implies intraneural injection. 2. Make sure you avoid the Popliteal vein which is compressed by the probe and may not be visible. 3. Aim for paraneural injection between the two nerves. The Tibial is the more important. We use 15-20ml of Local Anaesthetic. (Tabaoda Anesth Analg 2006;102:593). Onset times for blocks which penetrate the paraneural sheath are faster (15 vs 23 min) and more successful than those placed outside the sheath.